Arsenal have submitted an updated squad list to the English Premier League following the close of the January transfer window, informs the official website of the Premier League. Eleven players eligible to represent the Nigerian National Teams have been registered by The Gunners, with Alex Iwobi leading the way. Although the Super Eagle was born in Nigeria, he is classed as a homegrown player while the ten remaining players are U21 players. For the sake of clarity, according to Premier League rules, a "Home-Grown Player" means a player who, irrespective of nationality or age, has been registered with any club affiliated to The Football Association or the Football Association of Wales for a period, continuous or not, of three entire seasons, or 36 months, before his 21st birthday, and squads can contain no more than 17 players who do not fill the Home-Grown Player criteria. Apart from the 25-man squad list, clubs are permitted to include as many U21 players as they wish and for the 2018-2019 season, U21 players must be born on or after 1 January 1997, and this explains why Arsenal have as many as ten Nigerian starlets named. The Nigerian youngsters classed as U21 players are : Ryan Alebiousu, Xavier Amaechi, Folarin Balogun, Tolaji Bola, Kelechi Nwakali, Arthur Okonkwo, James Olayinka, Joseph Olowu, Tobi Omole and Bukayo Saka. It should be noted that ex-Golden Eaglets captain Nwakali cannot feature for the Gunners in the Premier League this season as he has been loaned out to Porto. 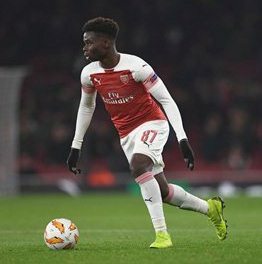 Bukayo Saka has been included in match day squads for the Premier League three times this season and made his debut in the competition in a 4-1 win against Fulham on January 1.